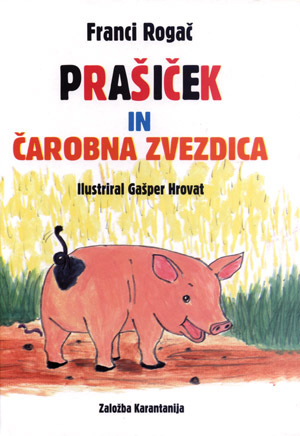 * Slovenski jezik: PRAVLJICA O PRAŠIČKU IN ČAROBNI ZVEZDICI! NEKOČ PRED DAVNIMI ČASI JE BILA V SLOVENIJI MAJHNA VASICA, SKRITA OČEM LJUDI. V NJEJ SO ŽIVELI MAJHNI ROŽNATI PRAŠIČKI S SMEŠNO ZAVIHANIMI REPKI. VSI SO SE IMELI RADI. MLADIČKI SO SE IGRALI IN ČOFOTALI V BLATU, STARŠI PA SO OPAZOVALI NJIHOVE NORČIJE. VSAK VEČER SO JIH MORALI POŠTENO OPRHATI, DA SO LAHKO ČISTI ODŠLI SPAT. VASICA JE IMELA TUDI SVOJEGA ŽUPANA, KI JE VSAKO LETO SKLICAL ZBOR PRAŠIČKOV, KJER JIH JE TUDI PREŠTEL. UGOTOVIL JE, DA V VASICI ŽIVI TOČNO DEVETSTO DEVETINDEVETDESET PRAŠIČKOV. NAD TEM SO BILI PRAV VSI NAVDUŠENI. KOT PONAVADI SO TUDI PO TEM ZBOROVANJU ORGANIZIRALI PRAŠIČJO VESELICO, KI TRAJA DO JUTRANJIH UR. ZVEČER SE JE NA NEBU POJAVILO NEŠTETO SIJOČIH ZVEZDIC, KI SO ŠE POLEPŠALE NJIHOVO RAJANJE. VSI PRAŠIČKI SO NAMREČ VERJELI V NJIHOVO ČAROBNO MOČ. ČE BOSTE TUDI VI VERJELI V ČAROBNO MOČ ZVEZDICE, BO ZAGOTOVO TUDI VAM IZPOLNILA ŽELJO! ONCE UPON A TIME THERE WAS A LITTLE VILLAGE IN SLOVENIA, HIDDEN FAR AWAY FROM PEOPLE'S EYES. IT WAS THE HOME OF LITTLE PINK PIGLETS WITH FUNNY-LOOKING, SMALL, CURLY TAILS. THEY ALL LOVED EACH OTHER. THE YOUNG ONES PLAYED AND PADDLED ABOUT IN THE MUD WHILE THEIR PARENTS WATCHED THEIR FOOLERIES. IN THE EVENINGS, THEY FIRST HAD TO BE THOROUGHLY SHOWERED, SO THAT THEY WENT TO BED CLEAN. THE LITTLE VILLAGE HAD ITS OWN MAYOR, WHO GATHERED THEM TO A PIGLET MEETING EVERY YEAR, WHERE HE ALSO COUNTED THEM. THIS TIME, THE MAYOR FOUND OUT THAT THERE WERE EXACTLY NINE HUNDRED AND NINETY-NINE PIGLETS LIVING IN THE VILLAGE, AND EVERYBODY WAS ENTHUSIASTIC WITH THIS NEWS. AS USUAL, THE MEETING WAS FOLLOWED BY A PIGLET FESTIVITY, WHICH NORMALLY LASTED UNTIL THE EARLY MORNING HOURS. THE EVENING SKY WAS DOTTED WITH INNUMERABLE SHINING STARS, WHICH MADE THE PIGLETS' MERRYMAKING EVEN MORE BEAUTIFUL. EVERYBODY BELIEVED IN THE MAGIC POWER OF THE STARS. IF YOU BELIEVE IN THE MAGIC POWER OF THE STAR, TOO, IT WILL MAKE YOUR WISHES COME TRUE AS WELL!